Molasses Reef is a SPA protected area and the result is a splendid display of massive, colorful coral, brightly adorned tropical fish, and large game fish. This reef area is home to over 600 different species of flora and fauna and is considered one of the best, if not the best dive site in the world. When Key Largo diving, this reef has something for everyone. You'll find some of the best snorkeling here. Plus the opportunity for capturing extraordinary underwater photography is almost unparalleled. If you have advanced diving certification you'll enjoy drift diving along the ledges where you can explore it's deeper regions such as the highly photogenic Deep Molasses. Here you'll encounter a tremendous variety of marine life, including huge sponges and different species of sea turtles. This reef also has somewhat of a mystery surrounding it's name. It's rather like Alligator Reef being named after the USS Alligator that isn't actually grounded there. The story goes that a barge or ship carrying the sugary compound grounded near this reef providing it with this sticky, sweet name. For 60 years this ship's true identity was unknown - she was simply referred to as the Molasses Wreck. However, in 2000 it was finally determined that she was the Vitric. However, the Vitric sits at 300 feet of water. 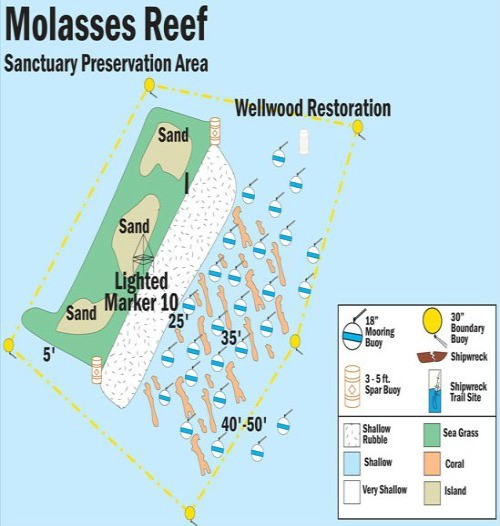 Molasses Reef is 90 feet at her deepest. So was there another wreck carrying this sticky substance that grounded here? Or did the Vitric, with her relatively close proximity, provide the name for this spectacular dive spot? Continuing the saga of what did ground here, one vessel left a very identifiable mark. 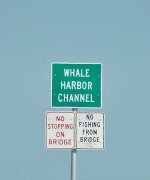 This wreck also happens to be one of the more popular Key Largo diving spots. The Austrian Slobodna ran aground with her cargo of cotton bales. It's this wreck's winch that is seen and marked at buoy M8. The Slobodna is often referred to as the Windlass Wreck because of this prominent remnant. Molasses Reef is without question one of the best diving Key Largo sites that's also hugely popular with anyone planning a Florida Keys snorkeling vacation. The large area is filled with a vast array of colorful coral, tropical and game fish. Plus the reef's ability to accommodate different levels of diver certification makes this a scuba diving Florida Keys best dive. Since the area has so much to see and do, a dive map of the area like this one from Amazon can be very useful. This will help you find your way around to the different, popular spots you won't want to miss, including Deep Molasses. You'll also want to make sure that you capture some underwater photography that includes the area's photogenic winch.